What is the coldest you've gone snowboarding/skiing in? We (Kev, dad, & I) went in -7 degrees with wind equaling -27 degrees. No big deal. We did a half day and started at 12 and could only make it until 3:30 (lifts close at 4pm). MY TOES were freezing SO bad!!! Actually everything was. My goggles never are cold but somehow the cold air was getting in the cracks (like between goggles/helmet- don't worry not a gaper). Anyways, it was SOOOOO cold. Not the best of skiing conditions but a good story nonetheless. Pretty crazy. 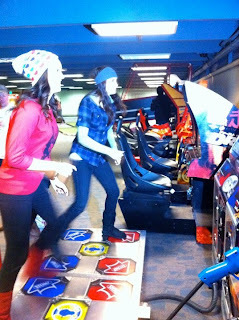 Here is Kelsi and I playing DDR in the arcade one of the nights... I am def not as good at DDR as I used to be haha. I don't know how to explain this ha but our aunt who teaches NIA/Zumba/Weight classes/Yoga...etc...has a picture album on Facebook titled "Life's a Balancing Act" and there are tons of pics like the one below balancing doing a pose so we had to do one haha. We took a lunch break up in a restaurant on the top of the mountain and then found Patrick who was meeting a friend! Oh we definitely ate chocolate and trail mix for our lunch this day! So bad! But cheap (because we carried it in our pockets) and fast- no wasting time on the mountains. Upset Panda. Hunter's favorite animal is a PANDA and he got this hat. He is so cute haha and I think he as in a bad mood here and got mad that I took this picture! Oh just at a big time burger joint. Okay that is it! Hope your Christmas break was just as great as ours. Part 1 here. If you missed it.